Colorado Criminal Law – The Denial Of Bail After Trial – While most Judge’s will continue the right to bail after a Colorado criminal conviction – there are circumstances when there may be a denial of bail and a remand of the Defendant to the county jail. This article addresses Colorado’s Bail Laws following guilty verdicts for Colorado criminal trials. 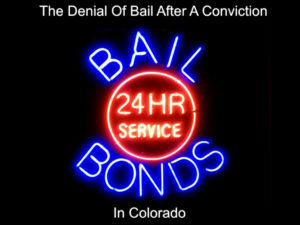 Colorado Bail Laws – Right To Bail – Ask – Is This Before Or After A Conviction? I have written articles on how bail works in Colorado, but I have never closely addressed what can occur after a plea bargain to certain crimes or more importantly because of the possible surprise element, what can happen when a jury returns an unfavorable verdict. The Basic Rule is this – There is no constitutional right to bail after conviction in Colorado. Colo. Const. art. II, § 19(2.5)(a). Following a criminal conviction, a Defendant loses the presumption of innocence and therefore the constitutional right to bail is no longer applies. The power to grant bail then becomes a creature of statute and left, by law, to the sound discretion of the trial court. § 16-4-201.5, C.R.S. To repeat this point – after a conviction, a Trial Judge has the right to decide whether or not to grant bail pending sentencing or appeal. Most Judges, if they have the authority to grant continued bail (with the agreement of the person or company posting the bond – called a “consent of surety”) WILL continue the right to remain on bail until sentencing. But there are certain crimes that are not “bailable” immediately after a jury verdict for that crime comes back. Any felony, if the person used a firearm during its commission. If pending an appeal, the appeal is not frivolous and is not pursued for the purpose of delay. (g) Child abuse, as described in section 18-6-401(7) (a) (I), C.R.S. (j) Stalking when there was a temporary or permanent protection order, injunction, or condition of bond, probation, or parole or any other court order in effect that protected the victim from the person, including but not limited to stalking, as described in section 18-3-602(5). (b) The appeal is not frivolous or is not pursued for the purpose of delay. (3) The provisions of this section shall apply to offenses committed on or after January 1, 1995. If a Trial Judge decides to deny bail after conviction – that decision – to grant or to deny bond – is reviewed on appeal under what is called an “abuse of discretion” standard. Practically speaking, that means the decision will NOT be reversed by another Judge or Court of Appeals absent very extreme circumstances. While there is no specific listing of factors that a Judge must consider in making the decision to grant – or deny bail – following a conviction, it could be persuasively argued that a Colorado statute that governs the criteria that should be applied should a Defendant decide to appeal a jury’s verdict seems to have application at the time the Judge makes this important decision. (i) The defendant’s likelihood of success on appeal. 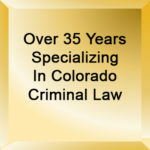 In Colorado, a Defendant is eligible for bond under one of two statutes: Section 16-4-102, C.R.S. — which governs bond “before conviction” — and Sections 16-4-201, C.R.S. and 16-4-201.5 — which govern bond “after conviction.” A Defendant should always respectfully ask a Court to grant bail pursuant to the latter authority following an adverse jury verdict following the criteria in the Appeal Bond statute and NEVER take it for granted that a Judge will automatically continue bond. H. Michael works hard to get his clients the best possible results in and out of the courtroom. He has written, and continues to write, extensively on Colorado criminal law and he hopes this article helps you in some small way – Colorado Criminal Law – The Denial Of Bail After Trial.